The San Mateo Queen Bedroom Group by Intercon at Dinette Depot in the Brookfield, Danbury, Newington, Hartford, Connecticut area. Product availability may vary. Contact us for the most current availability on this product. 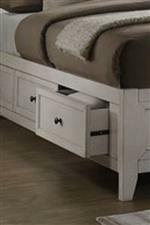 Bed Storage Under bed storage option available consists of three side drawers with cedar bottoms.